An allowance system is a common way for parents to motivate their kids, but like anything else, it doesn’t work for everyone. Our daughter will cheerfully do chores when asked, but almost never takes initiative herself, even with the promise of an allowance. I decided to seek out an alternative to allowance that would get her excited and make her feel like she had the ability to contribute to our family, without being pressured. Allowance was a big deal to me as a kid. I was essentially a serial entrepreneur from a young age and there was always something I was saving for. I remember in particular how excited I was to finally be able to pick up my “new” (OLD!!) IBM 286 computer I bought in third grade through the classified ads. However, money itself doesn’t have quite the same allure to my 7-year old daughter (perhaps that is a good thing!) I tried an allowance system last year and she gladly participated, but her earned dollars just piled up in a little treasure chest in her room. Eventually she grew bored with the idea and stopped even asking about her allowance. An allowance system is meant to be a positive reinforcer, but it can have the opposite effect if it is not working for your family. (“Losing” allowance as punishment for bad behavior or not finishing chores, homework, etc.) I didn’t want to continue something that made my daughter feel discouraged. So when the folks behind GoalUp reached out to me to try their new program, I thought it sounded like the alternative to allowance I had been looking for. GoalUp is a secure online tool that allows parents to set goals with their kids, monitor progress, and reward achievements. You create “goals” (tasks to complete) and assign them each point value. Points are preloaded by parents, so you can determine their potential spending limit/reward value. Kids earn points as they successfully complete these tasks and can redeem these points for real, tangible rewards (toys, games, and more!) It’s a fun, positive way to motivate kids! Since my daughter is in second grade, we set goals that mostly revolve around helping out more with household chores and completing homework assignments. We received 400 points to from GoalUp to review the program, which will likely last us a few months! That’s the beauty of it, since you determine how much each individual task is worth, you can set the pace for how quickly your kids can earn points. Our point values range from 5-20 per goal completed and we set about 15 tasks over the course of the first month. At the end of the month, my daughter can decide whether to cash in what she’s earned, or keep saving for a “big-ticket” item and add more points towards it next month. • With GoalUp my daughter was involved in the planning process. We sat down together and talked about ways she thought she could be helpful at home and at school. She took this project very seriously, and it was an obvious boost to her confidence knowing that her opinions were valued and incorporated into decisions. • By helping me assign the number of points to individual tasks, my daughter was able to better grasp the concept of value placed on work. Folding a load of laundry only takes a few minutes and is worth 5 points, but dusting the entire house is worth 10 points. By earning and saving points, kids learn that the things they want aren’t free! I think this helped my daughter finally understand what I mean when I say that “money doesn’t grow on trees” when she asks for a new toy. • The prize options are not just knick-knacks, they are really cool items that kids can get excited about! 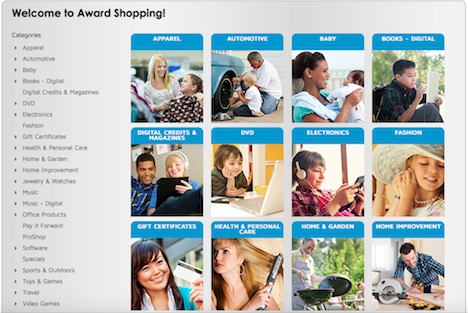 There are a range of prizes to fit all types of budgets, from digital books to scooters. My daughter was already enthusiastic about the GoalUp program, but the prizes were a sweet bonus and have definitely been effective at motivating her to earn the binoculars she is eyeing! • GoalUp is a positive reinforcement technique! Kids earn rewards for completed goals, but there is no punishment for goals not met and they never “lose” points. Kids have the power to decide just how much they want to earn by completing goals. 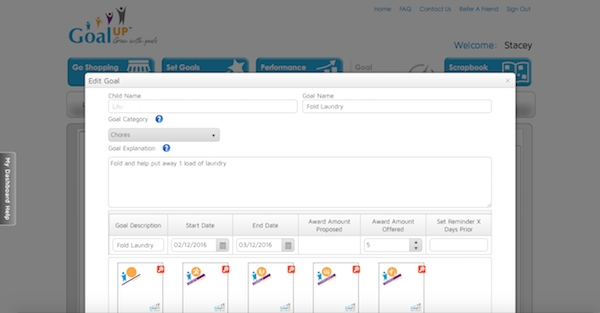 • GoalUp is easy to use — the user-friendly online tool keeps track of everything for you! No time-consuming chore charts or forgetting to pay allowance! • As an online tool, GoalUp is appealing to today’s generation of tech-savvy kids. My daughter was thrilled to be able to use the computer to type in the goal descriptions herself. That was almost a reward in itself! Disclaimer: This post is sponsored by GoalUp; however, all opinions are 100% mine. This is a great idea. 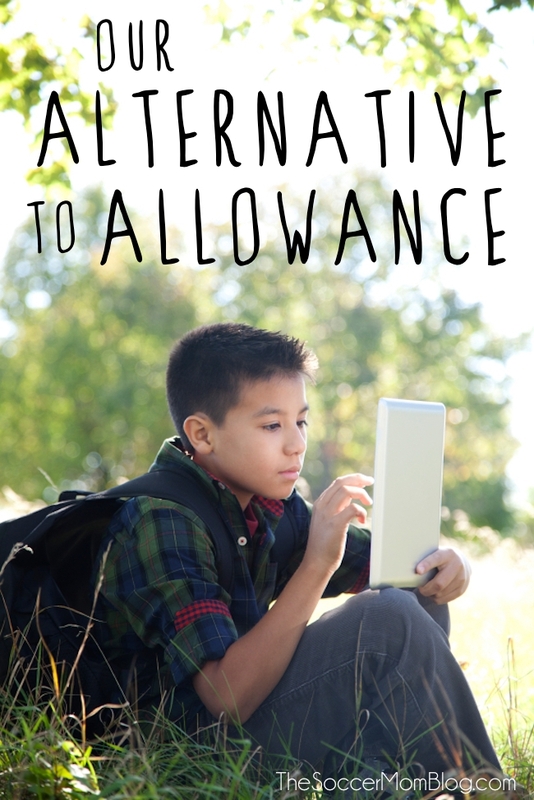 We’ve thought about allowances with our five kids for a long time… but I felt like being part of our family was something that they get to be a part of and so doing chores should be a way they feel like they can earn their keep. I like the option of the more modern Goalup and I think we’ll be taking an approach similar to it in the future. I’m with you on the “earning their keep” part 🙂 We’ve enjoyed GoalUp because it helps motivate my daughter to go above and beyond. what a great idea Stacey. I will be bringing this program to my daughter’s attention. She has hummed and hahed for years over how to give her 4 children an allowence, but this might be part of the solution se’s looking for, Keep up the good work. I love ready your blog.